Have fun entertaining and impressing your fellow guitarists, non-guitarists and yourself with this incredibly effective set of tapping and soloing tools. 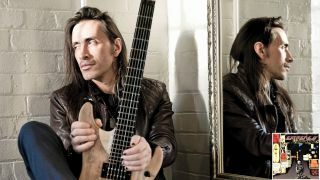 Hailed by Guitar World as a “Fretboard Wizard” and voted Best New Talent in our 1991 readers’ poll, Nuno Bettencourt has — thanks to his consistently inventive, virtuosic playing, killer tone and skillful songwriting — maintained his musical relevance and renown since first coming onto the national scene in the late Eighties. Best known for his work as guitarist for Extreme, Nuno also has lent his talents to collaborations with a diverse range of artists, such as Jane’s Addiction frontman Perry Farrell and R&B superstar Rihanna. Extreme’s 1990 album, Extreme II: Pornograffitti (A Funked Up Fairy Tale), is a rock guitar tour-de-force featuring incredible riffs, an amazing tone (compliments of Nuno’s signature Washburn N4 guitar, Bill Lawrence L500-XL pickup and the classic ADA MP-1 preamp) and wildly creative and technically fascinating guitar playing. Of the many amazing signature licks that can be found on the album, one of the coolest employed by Nuno is his “tapped string-skipping add2” pattern, showcased brilliantly on such standout tracks as “Get the Funk Out” and “He-Man Woman Hater.” The basic idea is illustrated in FIGURE 1. What sets this lick apart is its intervallic interest generated by the string skip and position shifts in the tapped notes. Theoretically, the line outlines a Cadd2 arpeggio (also known as Cadd9) — C D E G — but what’s important is its melodic shape, or contour. To perform the lick, your fret-hand index finger will need to shift down one fret each time you move to a higher string — from the 10th fret to the ninth, then the eighth — and as those moves occur, your tapping finger hits the same fret on the D and G strings (the 17th) then moves down two frets on the high E string. To get the ascending pattern down (the first nine notes), you can begin by practicing only the fret-hand fingerings, and then just the tapping, then put them together and work on coordinating the two hands. Notice that the ascending pattern has you going “tap, pull-off, hammer-on” on each string, and the descending pattern that follows (the next nine notes) has a different repeating contour, with a tapped note followed by two consecutive pull-offs, also known as a double pull-off. Also note that the C note on the high E string’s eighth fret is then repeated on the 17th fret of the G string. The taps and hammer-ons should be quick and firm, and when pulling-off, be sure to flick the string slightly sideways, down toward the floor, as you release it. These techniques, properly performed, will keep the string vibrating sufficiently, make each note project cleary and maintain a consistent volume. It’s also very important to suppress any unwanted background noise, by palm muting the unused A and low E strings, to prevent them from ringing. FIGURE 2 is a fluid tapping run based on the previous Cadd2 pattern that works well in the key of G major, as well as its relative minor key, E minor. It combines the Cadd2 shape with a structurally identical one two frets higher, which “paints” a Dadd2 sound (D E F# A). The figure sounds cool when played fast and looped. Thinking diatonically within the key of G major or E minor and searching for the same shape on the same string group, there’s only one other chord/arpeggio that fits the criteria: Gadd2 (G A B D). FIGURE 3 adds Gadd2 to the Cadd2 and Dadd2 arpeggios in the context of a I-IV-V-I progression (G C D G). As with our initial example, you may find it helpful to focus on each hand’s part and fret assignments separately at first, then coordinate them. Note the wide position shift from bar 3 to bar 4, where everything abruptly moves down seven frets. FIGURE 4 has us switching between the previously-learned shapes on the D, G and high E strings to their visually symmetrical and identical counterparts on the A, D, and B strings, which give us the arpeggios Gadd2 and Add2 (A B C# E). The implied progression here is Cadd2 Gadd2 Dadd2 Aadd2, and the only note that is not diatonic to the key of G (G major scale: G A B C D E F#) is the C# in the final bar (D string, 11th fret). But played at high speed, the note fits perfectly, and depending on what you play it over, in terms of the accompanying bass note or chord, it can yield some harmonically interesting results. For example, played over an Em chord, the C# note would suggest an E Dorian sound (E Dorian mode: E F# G A B C# D). Over a G chord, it would imply the G Lydian mode (G A B C# D E F#). In any case, the figure just sounds cool when played fast! Our final example, FIGURE 5, is inspired by the one of Nuno’s signature tapped phrasing patterns. Note the slight “speed burst” with the 16th-note triplet at the end of beat two and the fret-hand hammer ons “from nowhere” that fall on the last 16th note of beats three and four. Practicing and mastering this fret-hand tapping technique (which, by the way, also figures prominently in the tapping styles of other great rock guitarists, such as Reb Beach and Eddie Van Halen) will give you additional cool phrasing and line contouring options to craft and spice-up any of your own string-crossing tapping licks. Try applying this pattern to all of the implied progressions from the previous four examples. Integrating these fretboard shapes and techniques into your tapping and soloing vocabulary will give you more tools for building a lead to a musically exciting crescendo, and the examples presented here will hopefully set you on the path to creating your own variations. Feel free to experiment with them and modify the patterns to suit your own favorite keys and arpeggio shapes, and look for other interesting diatonic permutations, in your quest to find that perfect part for a solo you’re composing. These kinds of licks sound as fresh and exciting today as they did nearly 30 years ago, so have fun entertaining and impressing your fellow guitarists, non-guitarists and yourself (!) with this incredibly effective set of tapping and soloing tools. Happy shredding!